While South Bend locals may be fully aware of Frankie’s BBQ on West Washington Street, just minutes from downtown, many may be unaware of what goes on inside the huge 65,000-square-foot building across the street. Inside is the headquarters of Manufacturing Technology, Inc. (MTI), the world’s only company whose primary business is developing, designing and building all forms of friction-welding machines and systems for a diverse range of industries, from aerospace to automotive and everything in-between. Friction welding is a forging technique that involves generating heat with relative motion and force to create friction between two materials that join them together. Founded in 1926 and known as Adams Engineering, the fourth generation, family-owned business went from tool and die maker to global leader in friction-welding technologies and solutions. “The company had to pivot several times in its history in order to stay relevant to the market,” said Dan Adams, part-owner, president and chief technology officer for MTI. Like many companies in the South Bend area it worked with Studebaker, building automated, cut-away displays of actual car assemblies for trade shows. The elaborate displays featured lights and moving parts. Similar to machine automation, it took the precision of a tool and die maker to produce the displays. MTI established a relationship with Caterpillar Tractors, which had rights and patents to the inertia welding process. MTI started building and automating friction welders for Caterpillar. Caterpillar then decided to get out of the machine-building business, giving MTI the opportunity to buy the rights to the friction-welding technology. That started MTI in 1976. It also meant going from a regional focus with tool and die to a more global approach with friction welding, eventually tapping into locations in the United Kingdom and China for additional manufacturing service and support. “Our niche is really large machines, primarily coming out of the aerospace industry. We do a really good job of managing our customers’ risks through our technology and experience. The success aspect of our business is based on the fact that we build large machines that are high-risk to anybody else,” said Adams. He points out that the relationships, trust and credibility they’ve established with customers make it too risky for them to find a lower-cost, alternate supplier. “We see so many different applications in a variety of industries. We have an aerospace specialty because that is where the big machines are, but we cross a lot of different industries from trucking to consumer to military. Automotive is where the volume is. That diversity has allowed us to survive different business cycles in our 40 years of friction welding and in our 90 years of being in business. That diversity of customers is a great balance,” he said. MTI delivered to aerospace manufacturer Pratt & Whitney the world’s largest linear friction-welding machine and the world’s most advanced rotary friction machine for the Manufacturing Technology Center in England. 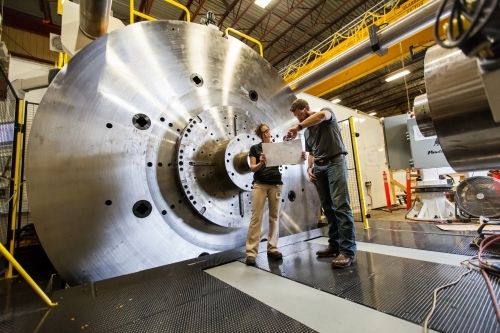 The company has even built machines for NASA that made cryogenic fuel tanks for rockets. Finding a skilled workforce means MTI is active in not only developing its own programs but also collaborates with area schools and universities, the city of South Bend and Chamber to ensure its employees have the skills the company needs for the long-term. “We’re investing heavily in co-ops, internships and other internal training programs, documenting our knowledge so that we can have a self-sustaining development system for engineers, sales, machine assembly—those sort of critical and technical positions,” said Adams. MTI’s process in securing talent is starting from the ground up. “We are trying to do less hiring of the ‘ideal’ candidate with 10 years’ experience and, instead, building these people from a grassroots level.” Attitude, motivation and problem-solving are key to a successful MTI employee. The company partners with area high schools participating in Manufacturing Day, which exposes high school students and educators to the real world of manufacturing and what opportunities lie there. “We are trying to do what we can in the community to build excitement so people understand what MTI is and what manufacturing is about to drive local desire for students to stay in the area and succeed in the area,” he said. Accessing the area’s colleges and universities for talent is also increasing. As part of its research budget to explore one of its processes, MTI sponsored a University of Notre Dame doctoral student, and continues to work with the university’s ESTEEM entrepreneurial graduate program with students developing a business plan for the launch of a new technology being developed. This year MTI will achieve record sales of $55 million. When Adams, his brother and sister took over the business in 2002, the company averaged $14 million in annual sales. Contributing to the record sales is MTI’s recent acquisition of a resistance-welding company in the United Kingdom, doubling the size of MTI’s UK subsidiary and revenue generation in that country. Locally, MTI purchased a 127,000-square-foot building on Sheridan Avenue in South Bend. The new facility will more than double the size of the company’s growing manufacturing services division. “Just like any company we’re having to stay on the cutting edge of our own technology. We’ve invested heavily in a couple of R&D programs to continue to drive our market and differentiate ourselves,” said Adams.Heading into 2017, it’s going to be a pretty exciting time for MTI because we are going to be selling some items that are new to the industry and have major competitive advantages,” said Adams. Visit mtiwelding.com for more.